Apples and cheese? Trust us. Serve this crisp as a side — or as a dessert, with a scoop of vanilla ice cream. 1. Preheat oven to 400º. Quarter and core (but do not peel) apples. Cut pieces into very thin slices. Toss with spice, salt, flour, sugar, and 2 cups of cheese. 2. In a small bowl, mix granola and butter with fingers until crumbly. Place apple mixture into a greased 9 x 9-inch baking dish. Bake for about 20 minutes. 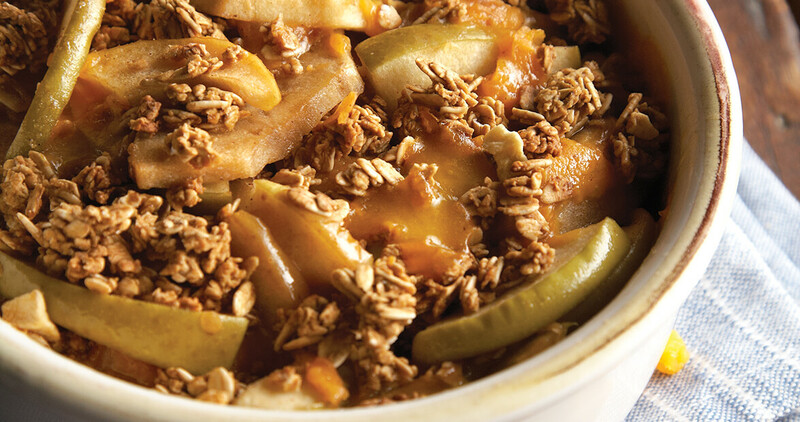 Reduce heat to 325º, and scatter granola crumbles over the apples. 3. Continue baking for another 10-15 minutes until apples are tender and topping has browned. Remove from oven. Top with remaining cup of cheese, and let stand until melted. Serve warm.